Set over three summers at The Westival, a fictional West Australian rural folk festival redoubtable local radio personality ‘Queenie' describes as "Australia in a tent". Two young musicians fall in love against a wider collection of tales dealing with a microcosm of contemporary discussion points, including Indigenous, immigration and refugee issues. 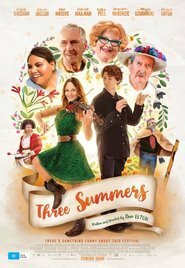 THREE SUMMERS comes across as if an immature screenwriter has tried to include as many Australian social observations and issues as possible in 1 hr 42 mins without worrying too much about how they fit together. Despite that, there are moments that are touching, funny, and incisive. It’s like watching a series of disjointed comedic gags that have no real plot line, although the romance between two of the characters does provide a bit of a backbone to the movie. It’s fun and, although a short movie, seems longer than it needs to be.